Natural remedies are always welcome in health supplements because they ensure that the product does not lead to unwanted side effects, and it also offers holistic treatment your body will be thankful for. In the case of joint pains, certain herbal extracts like turmeric and ginger are well known to reduce pain and inflammation and they have been used traditionally for years. Nature’s Life Turmeric Ginger Joint Ease contains only these two ingredients, so, in case you are only looking for an adjuvant to help you get rid of the pain, it may be useful. Since the product enjoys some positive reviews, we decided to take a closer look to it, as well. What Does Nature’s Life Turmeric Ginger Joint Ease Contain? Nothing else is included in each pill and each serving, the manufacturer gives assurance. While both ginger root and turmeric extract are known to have great benefits for joint health, they cannot alone treat serious joint conditions. For what is worth, this is a good formula for what it is, but do not expect any wonders. 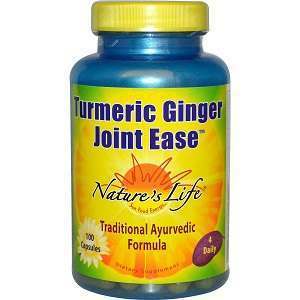 The recommended dosage for Nature’s Life Turmeric Ginger Joint Ease is four capsules daily. The manufacturer recommends taking two one time, and the other two at a different hour of the day. A bottle with 100 capsules has a listing price of 14.16USD and it lasts for 25 days. Nature’s Life Turmeric Ginger Joint Ease is sold through third parties, so you may have to rely on resellers for any refund. Herbal remedies are great to have in any joint health supplement, but they are not enough to guarantee the same great results as other formulas sold on the market. Since Nature’s Life Turmeric Ginger Joint Ease contains nothing else but ginger root and turmeric extract, it does not look like a very powerful formula. Nonetheless, it is safe to use and it can reduce inflammation and pain in the joints, without addressing the more complex issues, such as loss of cartilage throughout the day. Mark Stevens	reviewed Nature's Life	on December 2nd	 and gave it a rating of 2.